As for this recipe, this is one of my favorite items off our menu at Morimoto. My photo doesn’t do it justice since I didn’t have all the ingredients on hang, but I wrote the recipe to fit how it is at work and found a photo online of the actual thing. If you are not able to find an anchovy aioli recipe, a garlic aioli would probably be equally as good. You can also substitute some minced regular cilantro for the micro. 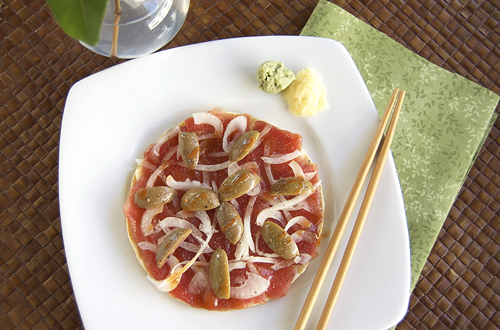 I would never have thought of using olive with sashimi tuna, but it is SO good. If you ever go to Morimoto, you HAVE to try the tuna pizza. 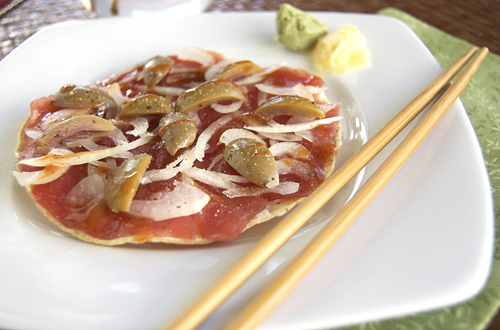 Place the ahi tuna slices on top of the tortilla, completely covering. Add the olives, jalapeno, tomatoes and red onion; slice the pizza into six pieces. Add a drop of Tabasco sauce on each slice. Using a squirt bottle, cover the pizza with thin lines of anchovy aioli. Season with sea salt and garnish with micro cilantro to serve. Tuna pizza on tortilla ! That’s a really great recipe!